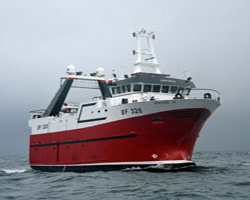 Macduff Shipyards Ltd reports that it has completed its “largest fishing vessel to date”, in the form of the 29.87m loa Venture III. Constructed for Whitehills-based skipper Mark Lovie, the newbuild was ordered to replace his existing vessel, Venture II, which was originally built in 2001. Venture III features a breadth of 10.5m and a moulded depth of 7.2m. Her hull form, which was fabricated by Finomar in Poland, features a large bulbous bow and flared stem, and a ballast box keel has been fitted alongside deep V bilge keels for reduced transverse roll. Onboard capacities include 97,685litres of fuel, 29,409litres of fresh water and 40,517litres of ballast water. The vessel is powered by a single MAK 8M20 engine, rated 1,060kW at 900rpm, supplied by Finning UK. This powers a four-bladed, closed-pitch propeller with a diameter of 3,100mm via a Mekanord 650HS gearbox and a Helseth 4TX750/240-3100HSD stern gear. The propeller has been fitted within a high-lift propeller nozzle and triple rudder system supplied by BT Marine. Control of the engine, gearbox and propeller is facilitated by a three-station control system in the wheelhouse, provided by Trevor McDonald (Marine Engineering Services) Ltd.
Finning also supplied Venture III’s twin CAT C9 generators, each rated 200kWe, which cover her onboard power needs, while Hardy Engineering has supplied the boat’s T700 bow thruster, which is fed by the deck machinery hydraulic pumps. The vessel's entire deck machinery package was supplied by Rapp Ecosse UK, and includes gear, fish room, sweep, bagging and split trawl winches, as well as a Toimil T-35000MT crane, rated 35tonnes, and an ALW580 anchor/mooring winch, which features a core pull of 5.7tonnes.